We resumed our bimonthly blind tastings with Napa Cabernet blind tasting. I wanted to share some of the bottles we had brought back from our trip in March, and what better way than a tasting? Given the expensive nature of Napa Cabs, I have to wonder if the guests felt the same way. Days before, Ted joked that he was was decanting his wine for two days to improve the taste. He teased about how good it was smelling. We started with a toast to Shannon's birthday, drinking Sue's favorite champagne from our visit to Mumm's. We had quite the spread. Bob had brought a plateful of scrumptious cheese, Lili brought a basket of incredible empanadas, and we had a plate of Italian meats. Yumm! We indulged outside while we waited for everyone to arrive. The last couple arrived just before seven. It was getting cold out, so we moved inside, blinded the wines, and started tasting. Things were a little tight, space wise. We need more of a banquet hall to handle a tasting for 12, but we made do. We crowded into the family room. Who invited Wilson? Almost everyone thought the quality of the wines was much higher than usual. Jennifer told us Napa Cabs were her favorite, and she couldn't help enjoying them all. My notes were pretty pathetic, but Shannon's sounded like a haiku. We made it through the 9 wines and tallied up the votes. F - 2008 Opus One came in first place with an average of 3.95. Ted and Shannon brought this. It cost $180. G - 2006 Darioush came in second place with an average of 3.91, a virtual tie for first. We picked this up at the winery on our recent Napa trip. It cost $88 at the winery. 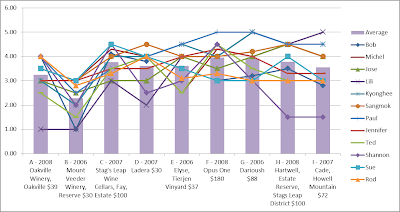 H - 2008 Hartwell, Estate Reserve, Stags Leap District came in third place with an average of 3.78. We also picked this up at the winery on our recent Napa trip. We payed $100 for it at the winery, which was club price, retail is $125. 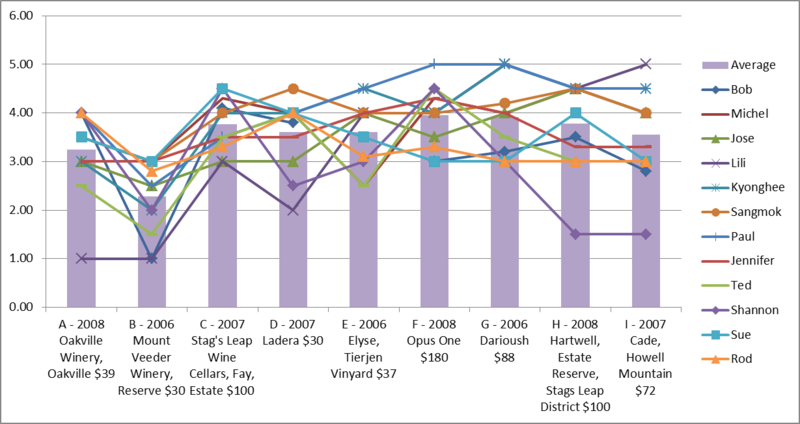 C - 2007 Stag's Leap Wine Cellars, Fay, Estate came in fourth place with an average of 3.77, a virtual tie for third. Paul and Jennifer brought this. Stag's Leap is Jennifer's favorite winery. They paid the club price of $100. D - 2007 Ladera came in fifth place with an average of 3.61. Bob brought this. KnL's website help convince him: 90 points Robert Parker's Wine Advocate: "The least expensive effort, and a top value for a Napa Cabernet..." It cost $30. E - 2006 Elyse, Tierjen Vinyard came in sixth place with an average of 3.60. Michel brought this. He had been to the winery years ago and really enjoyed it. It cost $37. I - 2007 Cade, Howell Mountain came in seventh place with an average of 3.55. We also picked this up at the winery on our recent Napa trip. It cost $72 at the winery. A - 2008 Oakville Winery, Oakville came in eighth place with an average of 3.25. Sangmok and Kyonghee brought this. A wine lady at Costco recommended it to them after they said they were looking for one for a group wine tasting. She said she tried it and liked it a lot. It cost $39. B - 2006 Mount Veeder Winery, Reserve came in last place with an average of 2.28. Jose and Lili brought this. It had a 93 rating and cost $30. I was pretty shocked when I saw OpusOne won. It and the Darioush were incredible over blended, smooth wines. Ted and Shannon continue their dominance of the events they attend. After tasting we enjoyed grilled beef, vegi, chicken, and shrimp kabobs, and a sweet dessert that Michel brought.